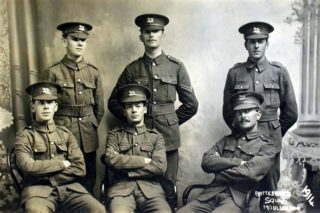 Enlistment photograph of Bottesford men, believed to have been taken in 1914. The man on the left of the back row is believed to be Tommy Robinson (6th Leicestershires). 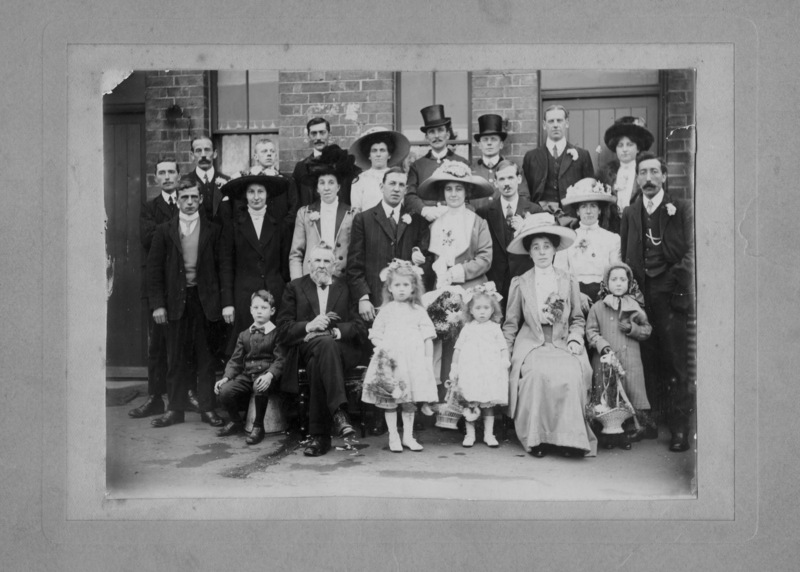 Tommy Robinson (back row, 3rd from right) wearing a top hat at the wedding of his sister Mary. Tommy Robinson in the 1920s or 30s, one of the Bottesford British Legion bowls team. From the collection of Mrs Anne Hewitt. Tommy Robinson (right) and another gentleman by the south door in the chancel at St Mary's, Bottesford, probably in the 1960s. Tommy Robinson, left, rolling the lawn as Bill Sutton marks the lines for a bowling match at the Rectory, Bottesford, 1920/30s. Bottesford Heritage Archive, from the collection of Bill Sutton. 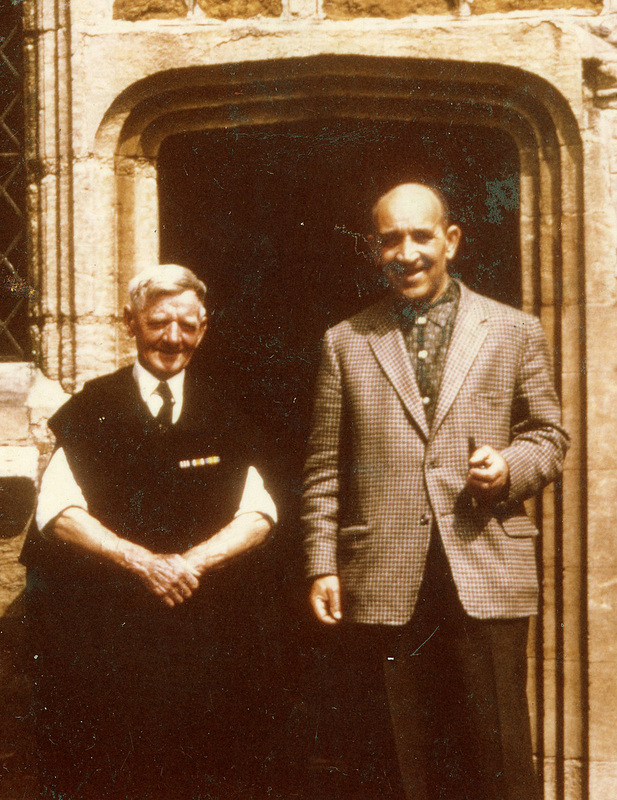 Tommy Robinson (left) and another gentleman by the south door in the chancel at St Mary's, Bottesford, probably in the 1960s - can anyone identify the man on the right of the picture? Verger Tommy Robinson, wearing his robes and ribbons. 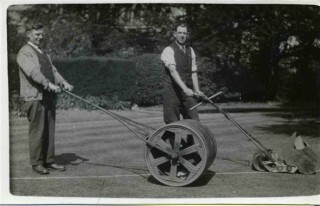 Bottesford Heritage Archive, from the collection of Mrs Ada Bond. Thomas (Tommy) Robinson was born in 1887 or 1888 at Sudbrook in Lincolnshire, son of Joseph and Abigail Robinson. In the census of 1891, Joseph Robinson, aged 33 (born about 1858 at Swarby, Lincolnshire), was at work as an agricultural labourer. His wife was Abigail Robinson (born about 1863 at Osbournby, Lincolnshire), and they had four sons: George (b. abt.1883 at Swarby), Charles (b. abt.1886 also at Swarby), Thomas (b. abt.1888 at Sudbrook, Lincolnshire) and Samuel (b. abt.1880 at South Witham). The family lived on Church Street, South Witham, next door to the Rectory, home of the rector of South Witham, Rev Ralph Tollemache (b. abt.1827 at Bath, Somerset). It is reasonable to conject that Joseph worked for the rector on the glebe farm. By 1901 the Robinson family had moved to Swinstead, where they were living on Main Street. Another son (Joseph, aged 4) and a daughter (Mary, aged 10 months) had been born and Joseph senior still worked on the land. Thomas was now employed as a farmer’s boy and was aged 13 years. 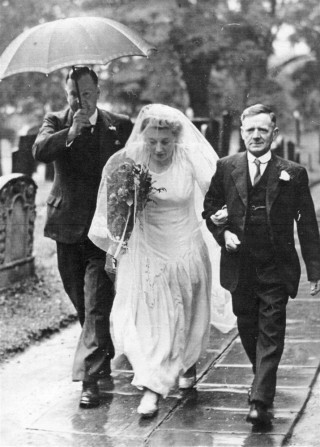 In 1911, he married Florence Allcorn at Bottesford. Florence was born in 1883, one of the children of William (a platelayer) and Elizabeth Allcorn, who lived in one of the railway cottages by Bottesford South station. Florence had three brothers, Arthur, George and Percy, who all served in the forces during WW1. During WW1, Tommy Robinson was a Lance-Corporal in the 6th Leicestershires, and was awarded the Military Cross. He is one of the soldiers (on the left at the back) seen in the “Bottesford Squad 1914” photograph with the regimental badge clearly visible on his cap (courtesy of Mr Ian Harris). A search of the Forces War Records database located four soldiers called T. Robinson in the Leicestershire Regiment during WW1, but only one of these was reported to have belonged to the 6th Battalion. This was: 27922 Private T Robinson, 6th Battalion, Leicestershires. This soldier suffered shrapnel wounds on the 22nd March, 1918. According to the ‘Long Long Trail’ website, the 6th Leicestershires was a service battalion formed in August 1914 as part of Kitchener’s new army. It had initially been attached to the 9th Division, but in April 1915 was transferred to 110th Brigade, 37th Division, and landed in France on 29 July 1915. On the 7 July 1916 the 6th was transferred back to the 21st Division, where it became part of the 110th Infantry Brigade, the “Leicesters Tigers”, along with the 7th, 8th and 9th Battalions of the Leicestershire Regiment. The fact that Tommy Robinson was photographed in uniform in 1914, strongly suggests that he enlisted very early in the war, soon after the 6th was originally formed, and the fact that he was wounded in 1918 further indicates that he served at least until 1918. One story that is told is that Tommy Robinson was absolutely covered in fleas when he returned from the Front, in fact he was “Flea’d up”. His wife Florence made him stand outside the house and remove all his clothes. She then brought out the bath, filled it with boiling hot water and he was washed from head to toe. [Lice and fleas were a constant problem for infantry men serving in the trenches, so this story is easy to believe]. He was awarded the Military Medal in WW1 for Bravery in the Field (London Gazette) He was in the same battalion of the Leicestershires as another local man, Edgar Culpin, who was also awarded the Military Medal. After demobilisation, Tommy worked at the Vineries nursery on Belvoir Lane, then in 1922 as a coachman to a former Rector at Muston [It is unclear which rector this refer to. The Rev Francis Barratt was the active rector at the time, and the only ‘former’ rector would have been Francis Nugee who had retired to a village near Market Harborough, a long way from Bottesford and Muston]. He became both the caretaker at Bottesford school and sexton and clerk to the Parochial Church Council. He looked after the churchyard, cutting grass by hand. When there was a funeral, he would dig the grave, attend the service and then fill in the grave, for which he was was paid 15 shillings, hard work for a man only about 5’3” tall. He was also a bell-ringer and always tolled the Passing Bell. There would be a bell ‘introduction’ to the death followed by a number of tolls for a man and a different number for a lady. Then there would be a toll for each year of their age. 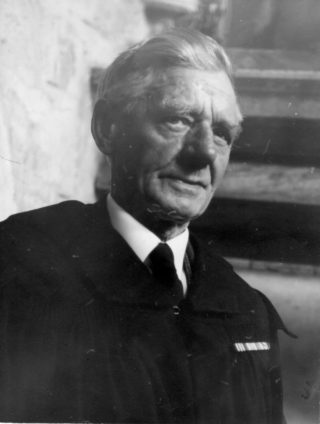 Thomas Robinson was the verger at St Mary’s Church Bottesford for over 40 years, after starting in 1927. He gave faithful service to three rectors, Reverend Frank Walford and to Canon Alfred Blackmore and, before Tommy retired, Canon William Metcalfe. It is remembered that he always wore his medal ribbons on his cassock. The record in the national Register of 1939 states that Thomas Robinson (b.17th December 1887), a clerk and sexton, and his wife Florence Robinson (b.20th September 1883) lived at Wyggeston Terrace, Bottesford, with their daughter, 17 years old Amy Elizabeth Turrell (nee Robinson), who was described as ‘seeking work’. The couple lived at Wyggeston Terrace for many years. Local people refer to Tommy and his wife being still at this address in the 195s0. In November 1964, the Grantham Journal reported the retirement of Tom Robinson (77), living in Wyggeston Cottages, adding that he had been the verger at St Mary’s since 1927. Not surprisingly, the parishioners regarded him as a ‘very loyal fellow’. They collected £76 in two weeks, and it is said that they thought that they would prefer to buy him a television set to watch in his lifetime rather than have the customary tombstone at his death. 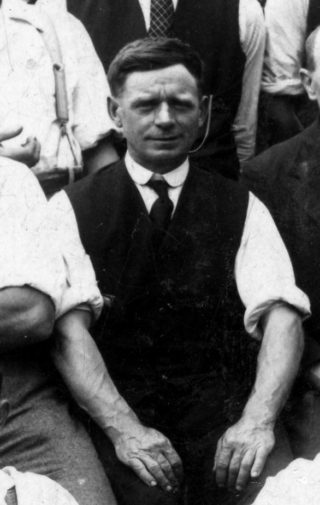 As school caretaker, Tommy Robinson was responsible for the care of the premises particularly when there were functions in the school rooms. Balls were held in the part of the building that is now the Bottesford Library, opposite the Market Cross. The dividing partition would be drawn back and Tommy would stoke up the fires so that you ‘were boiling’ and the floors would shine! The band would be positioned in front of the end window, which looked out on the Bull hotel across the street. Tommy also took charge of the gentleman’s cloakroom, situated in what is now the kitchen of the Fuller Room at the other end of the building. The ladies cloakroom, between the supper room and the ballroom, was in the charge of Mrs. Robinson. The New Year’s Ball would be organised by the Tennis club and the Young Conservatives would organise the Valentine Ball. There were also balls at Christmas (perhaps organised by the Church) and fancy dress balls – ‘when every one was well disguised’. The Robinsons had two daughters, Abbie and Betty. Abbie became Mrs Scotney, and Betty married Douglas Turrell. Florence Robinson died in March 1970, Thomas Robinson in February 1971. They are buried in the same grave in St. Mary’s churchyard, where the headstone records Florence Robinson, d.8th December 1959 aged 74, and Thomas Robinson, d.9, aged 83. “40 years the verger“.